At 0620 on May 4, 1945, Flight Petty Officer 2nd Class  Masaru Miyazaki took off from Kanoya Air Base in a Zero Fighter Trainer carrying a 250-kg bomb and died in a special (suicide) attack off Okinawa at the age of 18 . He was a member of the Kamikaze Special Attack Corps 5th Shinken Squadron  from Ōmura Naval Air Group. He was from Mie Prefecture and was a member of the 18th Otsu Class of the Navy's Yokaren (Preparatory Flight Training Program). If a flower has bloomed, it is prepared to fall. On O month and O day , I received an order as a member of the Kamikaze Special Attack Corps Shinken Unit. I had been waiting for the day of my sortie to be the next day and the next day, and finally my order for a sortie has been received. Being able to participate in the decisive battle in this country's crisis is an honor that surpasses anything else for a man who has been born. Please forgive me for not being able to repay anything for your kindness. Instead, I bravely will make a sortie thinking that making a taiatari (body-crashing) attack against the largest aircraft carrier and sinking it instantly will be a ten-thousandth of my filial piety. As for taiatari (body-crashing) attacks by local Special Attack Corps, please send younger ones to follow after me. Give my regards to the city mayor, the section head, and everyone in the neighborhood association. Please be glad. I also have received an order as a member of the Kamikaze Special Attack Corps Shinken Unit. As for this life, please be glad that I was born and have this body so as to able to participate in the decisive battle. Please think of me as a person who did not show filial piety by not writing for a long long time. Instead, I will make a superb taiatari (body-crashing) attack on a huge aircraft carrier and instantly sink the ship. At that time it will be a lonely victory. Please be glad and say that I did well. Although this is the end, a carefree person like me does not have anything to write. Fumiko, if I make a splendid instant sinking of a ship, please let me hear your singing the song "Gōchin" (Sinking a ship instantly) . I will make a taiatari (body-crashing) attack on a huge aircraft carrier so that you and others may be secure and be able to study. Take good care of Yasuko. Miyazaki wrote the following letter to his youngest sister. The entire letter is written in katakana, which is one of two kinds of scripts used for Japanese syllabary writing (i.e., each character represents one syllable). Japanese children learn katakana at a young age, so his youngest sister was probably in early elementary school or not yet in school. Yasuko, you probably do not know about my being in the Special Attack Corps. I also not know about you. Daily air raids must be scary. I will strike the enemy. I will make a taiatari (body-crashing) attack on a gigantic carrier. At that time, please make me glad by singing "gōchin, gōchin"  with Fumiko. 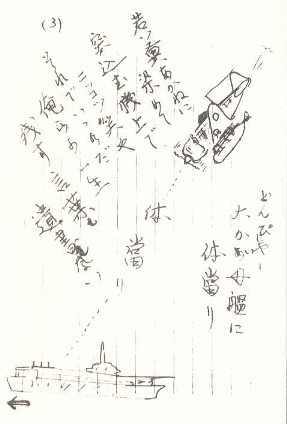 In addition, Miyazaki sent his family the following note  with a drawing of an aircraft with a bomb diving toward an aircraft carrier. The letters and poems come from Matsugi (1971, 46-50). The biographical information in the first paragraph comes from Kanoya Kōkū Kichi Shiryōkan Renraku Kyōgikai (2003, 80), Matsugi (1971, 46), and Osuo (2005, 202). 1. 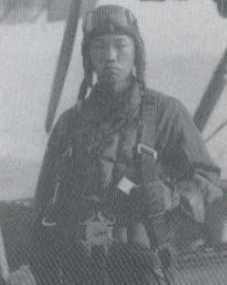 Matsugi (1971, 46) and Kanoya Kōkū Kichi Shiryōkan Renraku Kyōgikai (2003, 80) give Miyazaki's rank as Flight Petty Officer 2nd Class, but Osuo (2005, 202) indicates that his rank was Flight Petty Officer 1st Class. 2. Matsugi (1971, 46) gives his birth date as July 29, 1926, so this would make him 18 years old at the time of his sortie on May 4, 1945. Kanoya Kōkū Kichi Shiryōkan Renraku Kyōgikai (2003, 80) lists his age as 19 at the time of death. 3. Osuo (2005, 202) lists Miyazaki in the 4th Shinken Squadron, but Kanoya Kōkū Kichi Shiryōkan Renraku Kyōgikai (2003, 80) states that he was a member of the 5th Shinken Squadron, which is consistent with information in Tokkōtai Senbotsusha Irei Heiwa Kinen Kyōkai (1990, 197). 4. The O indicates that the date could not be provided in correspondence to civilians, since it was considered a military secret. 5. The OO indicates that the name of the air base could not be provided in correspondence to civilians, since it was considered a military secret. 6. Kanoya Kōkū Kichi Shiryōkan Renraku Kyōgikai (2003, 80) includes this one poem that Matsugi (1971, 46-50) does not have. It is shown after Miyazaki's last letter to his mother, but it is not clear whether it is part of the letter or a separate writing. 7. "Gōchin" is a Japanese war song that first appeared in 1944. 8. "Gōchin" means "instant sinking" of a ship. 9. The words around the drawing are not part of any of the translated last letters on this web page.